Plexiglas front door standard and is field reversible from left to right swing. Locks installed on front doors and rear section. 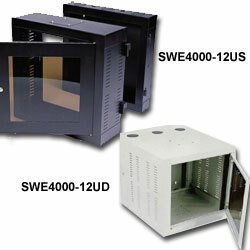 Available in a 24" or 12" depth, with 12, 18, or 26 rack spaces.